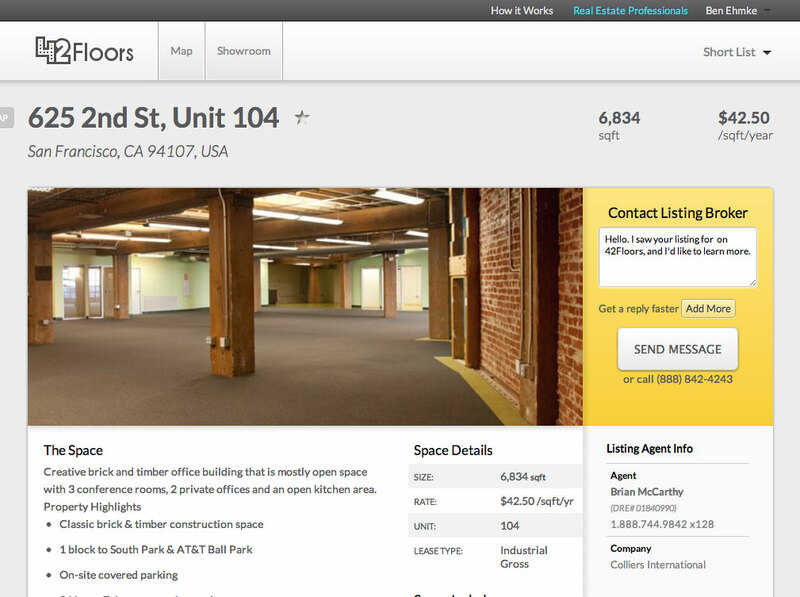 Ask any founders or CEO how they feel about the process of searching for office space for their companies, and the majority of them will shake their heads. Some may even lash out. There is a prevailing sense that searching for office space is, if not horrible, at least somewhat broken. Part of the reason for this is that the industry itself, writ large, remains offline. 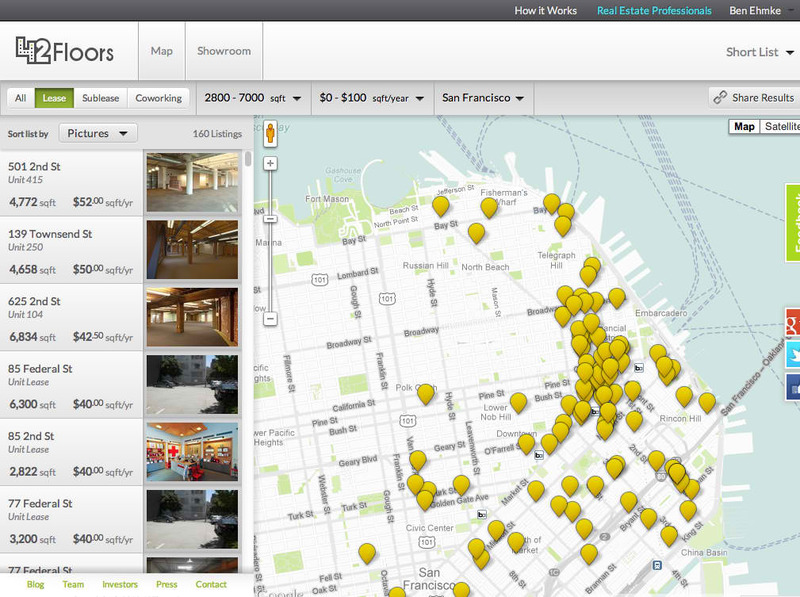 If you want to find great space, you have to go to a broker. Brokers have long horded their “proprietary data” keeping it offline as a result, but visit a handful of them and there’s a good chance you’ll find some overlap in their listings result. Deciding to create a solution, Jason Freedman co-founded 42Floors, which launched in May after after graduating from Y Combinator’s Winter 2012 class. Simply put, 42Floors aims to make the process of renting office space and commercial real estate easier by aggregating listings data from landlords and sellers, adding photography and then allowing users to search by indexing rentals, coworking spaces, sublets and executive suites. Based in the Bay Area, since launch, 42Floors has focused its efforts on the San Francisco commercial market, resolved to expand only once it had gained a robust data set and hit critical mass in its home market. That being said, the office space search engine is now ready to expand, announcing today that it is now live in New York City, after months spent forging partnerships with landlords and commercial real estate brokers in Manhattan. According to Freedman, the company’s strategy continues to be reinventing and bringing commercial real estate information and listings online, one city at a time. Learning from its experience in San Francisco, 42Floors quadrupled its capacity for its New York launch beforehand — a process it will repeat as it begins orchestrating its expansion to Boston, Seattle, Chicago and so on. To support its launch in NYC, 42Floors announced today that it raised a $5 million series A round earlier this year, which was first reported back in September. But the company is now pulling back the curtain on its investors — all 35 of them — an impressive roster of angels, VCs and real estate players, which includes Thrive Capital, Bessemer Venture Partners Reddit co-founder Alexis Ohanian, Chris Dixon, SecondMarket founder Barry Silbert and 500 Startups’ Dave McClure — to name a few. This the startup’s second round of funding, as it raised a $400K seed round after graduating from Y Combinator from YC, SV Angel and Start Fund and brings its total to just under $5.5 million. As a result of the funding, Kushner Companies CEO Jared Kushner and Bessemer Partner Jeremy Levine will be joining the startup’s board of directors. Having 35 experienced early-stage investors endorse your product is validating, so what is it about 42Floors that investors are getting excited about? After all, it’s not as if the company is alone in commercial real estate, with others like Cityfeet, CoStar/Loopnet, Easy Street Showcase and Property Shark playing in this space. First off, a commercial real estate and office space search engine falls right in the wheelhouse for startups and small businesses. Why? This is a no-brainer for those looking for space, but right now there’s still a significant, unfilled need: Most brokers are focused on closing high-priced listings because that’s where they make most of their money. So, the tendency is to ignore the smaller units. The problem, as Sarah wrote in March, is that 80 percent of commercial real estate transactions are under 5K-square feet. Because this size and price range generally appeals to startups and young businesses, that’s where the company has devoted its energy. The other useful feature of 42Floors’ listings is that they include photos. While that is becoming more of a standard practice among apartment and home search listings and search engines, commercial real estate is still a blank canvas. So, much the same way Airbnb has done for its rentals, 42Floors sends people out to scout listings and snap photos to add visuals to one-dimensional listings. The other key is that, while a listings and search engine may be useful for the one or two times a year when you’re looking for new space, 42Floors wants its platform to be a relevant destination for businesses year-round. The company’s core users are startup CEOs, founders and office managers, Freedman says, so in order to add value beyond moving day, 42Floors launched “Showroom” earlier this year — a marketplace that aims to aggregate all the things businesses may want after they sign a lease and begin their move. The site offers a collection of office furniture, a way to connect with interior designers and wellness programs, kitchen accessories and so on. For now, it’s basically a lead-gen aggregator, sending users to the sites where they can buy those items, but, down the road, the team hopes to turn Showroom into a full-service eCommerce destination. The real challenge, though, as we discussed in our recent coverage of HomeLight, is the dependency on brokers (or agents) in the real estate search process. This dependency is even greater in commercial real estate. So, because most brokers have kept commercial listing information offline, 42Floors has set out to partner with brokerage firms to bring that info online and help brokers begin to build a virtual presence. Freedman says that, at this point, brokers don’t really have a direct marketing channel, so working cooperatively with them has enabled them to post listings from brokerage firms in return for getting better access to potential clients (and marketing) than they would otherwise. While that’s good for the industry and the end user, the challenge is maintaining a balance and focusing on providing more accurate and in-depth information than the competition. Giving brokers a direct marketing channel has the potential to turn a great resource into a phishing service, even if bringing all this information online and providing more visibility into brokers and listings helps expose the crappy firms and brokers. The more 42Floors beefs up its matchmaking, design on its profiles, works on sending referrals in an integrated, not spammy way and keeps the other side happy by rewarding the best brokers out there, the more opportunity there will be. Freedman also said that he thinks one of the bigger mistakes startups tackling this space have made in the past is monetizing too early. 42Floors has been free to use up to this point and will continue to be for the foreseeable future, but referral fees will likely be part of the future equation. Not to mention that they’ll eventually be moving into retail, as Freedman says that, ideally, the company would love to become the Kayak of commercial real estate. But, in the near-term, they’ll be focusing on pushing out a suite of mobile apps both for those looking for apartments and brokers and honing in on the next market. For more, check out 42Floors at home here.